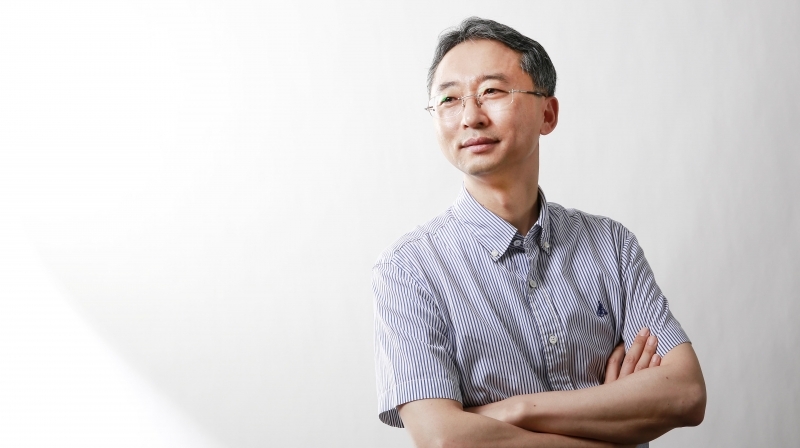 Prof. Sang-Young Lee (School of Energy and Chemical Enginering) has introduced a new class of solid-state flexible power sources that are fabricated directly on conventional A4 paper using a commercial desktop inkjet printer. 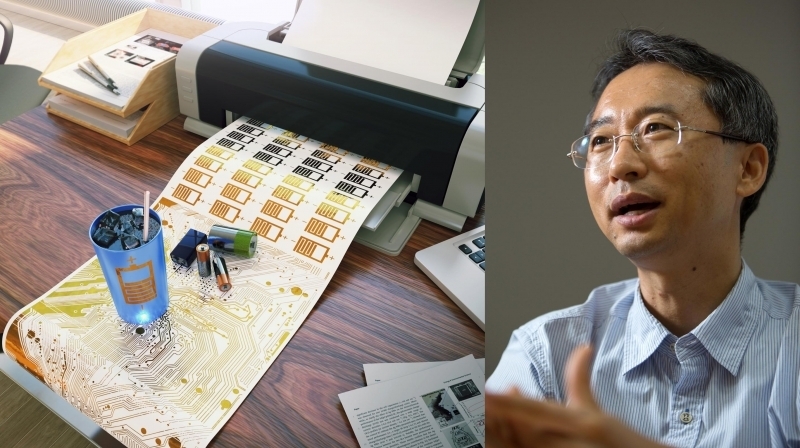 A new study, led by Prof. Sang-Young Lee (School of Energy and Chemical Enginering) has introduced a new class of solid-state flexible power sources that are fabricated directly on conventional A4 paper using a commercial desktop inkjet printer. 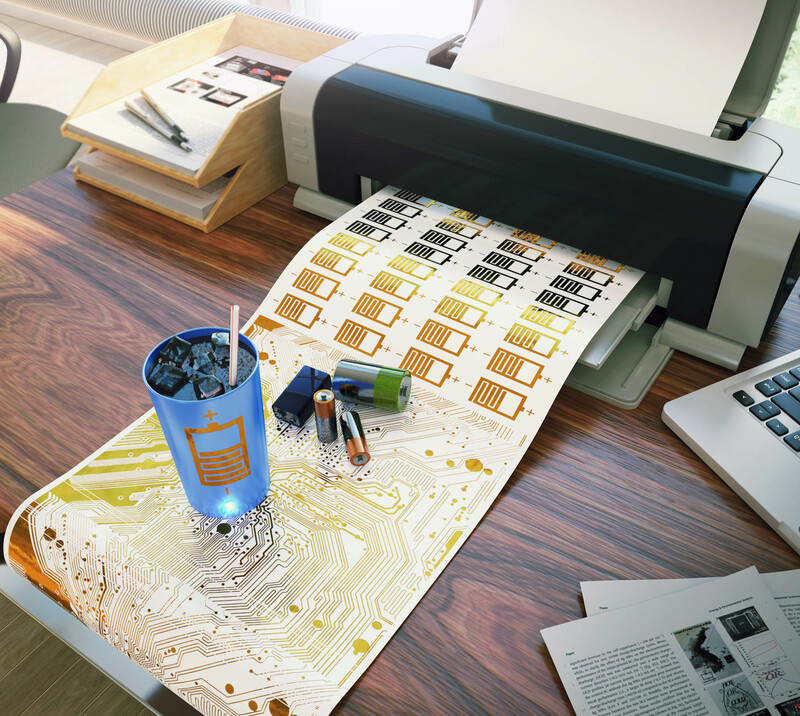 The new supercapacitors (SCs) appeared as typical inkjet-printed letters or patterns commonly found in office documents. The findings, published in the June 2nd issue of Energy & Environmental Science, suggest that this is a significant breakthrough for the forthcoming IoT and flexible, wearable electronics. According to the research team, these inkjet-printed SCs exhibited reliable electrochemical performance over 2000 cycles as well as good mechanical flexibility. Besides, they were also easily connected in series or parallel without the aid of metallic interconnects, thereby enabling the user-customized control of the cell voltage and capacitance. This is the schematic illustration of the stepwise fabrication procedure of the inkjet-printed supercapacitors, and a photograph of the desktop inkjet printer used herein. More notably, a variety of all-inkjet-printed SCs featuring the computer-designed artistic patterns and letters were aesthetically unitized with other inkjet-printed art images (e.g., a map of Korea) and smart glass cups, underscoring their exceptionally versatile aesthetics and potential applicability as a new class of object-tailored power sources. This work has been supported by Basic Science Research Program through the National Research Foundation of Korea (NRF) funded by the Ministry of Science, ICT and Future Planning . 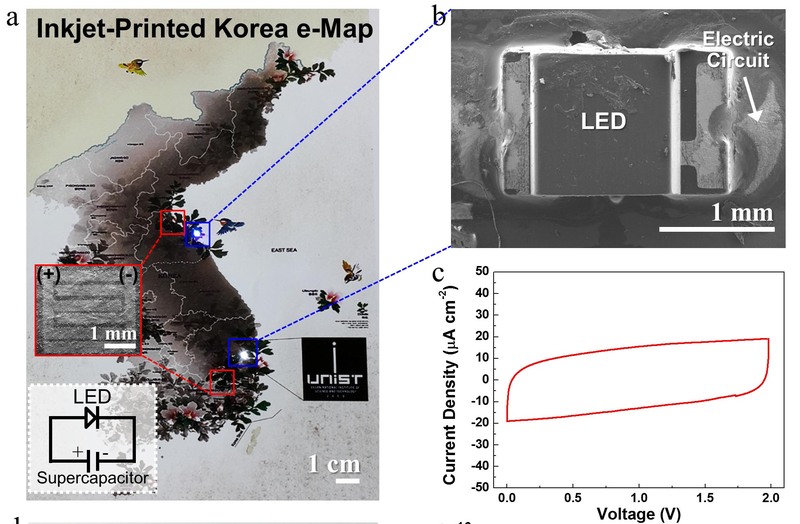 Keun-Ho Choi, JongTae Yoo, Chang Kee Lee, and Sang-Young Lee, “All-inkjet-printed, solid-state flexible supercapacitors on paper,” Energy Environ. Sci., (2016).